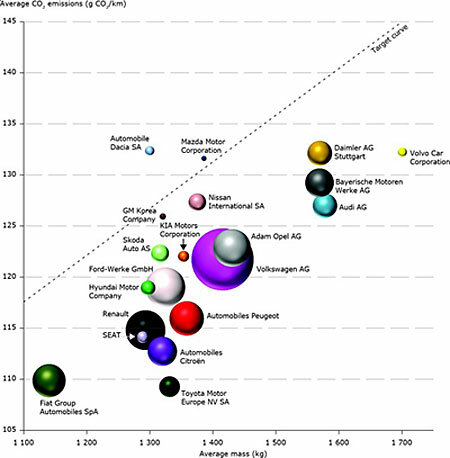 Of the 20 largest car manufacturers 18 are on track to meet 2012 CO2 targets, with the remaining two very close, according to the European Environment Agency (EEA). The EEA also found that five of these manufacturers are also on track to meet their 2015 targets. Meeting these objectives will help the transport sector achieve the ambitious target set of reducing greenhouse gas emissions by 68% between 2010 and 2050. However, the 68% target cannot be achieved simply through technical improvements, according to the EEA. EEA executive director Jacqueline McGlade said: "Some carmakers have made deep efficiency improvements in recent years, showing what is possible". "However, the transport sector needs to reduce greenhouse gas emissions by 68% between 2010 and 2050. This objective cannot be met with technical improvements alone, it will also require a significant reduction in transport demand and a shift to greener transport modes." Findings from preliminary data, published in June 2012, showed that new cars in 2011 were on average 3.3% more efficient than those registered in 2010. The drop in emissions was partly due to a growing proportion of diesel vehicles, while decreasing average engine and vehicle size has also been a factor for some manufacturers. However, the EEA found that alternative-fuelled vehicles made up a small proportion of new registrations in 2011 and did not significantly influence the overall trend. It also showed that registrations of pure electric vehicles remained low with under 9000 cars registered in the EU, despite a dramatic increase from the 700 registrations in 2010.